Lithium, which is a low-density metal is present in the earth’s crust in the amount of 65 ppm (parts per million). Lithium takes part in reactions with both organic and inorganic reactants. Lithium is usually found in the form of compounds with other minerals, usually in igneous rock or brine pools. High-energy density is the unique feature of lithium and due to this property, lithium can store a significant amount of energy in a very limited space. Lithium is primarily used in applications such as energy storage, air treatment, greases and lubricants, and glasses and ceramics. Examples of lithium applications include batteries (smartphone batteries), ceramics and glasses (fire-viewing windows for fireplaces), lithium soaps (lubricating greases), and air treatment (air-conditioners). In terms of product, the global lithium market has been categorized into lithium carbonate, lithium hydroxide, lithium chloride, and others. Lithium carbonate is the highly used product. Lithium carbonate possesses improved specific capacity and power density. Lithium hydroxide is soluble in water and it is available commercially in anhydrous form. Lithium hydroxide is primarily consumed in the production of lithium greases and it is used in breathing gas purification systems for spacecraft, submarines, etc. Lithium chloride is used for dehumidification. The others segment includes lithium derivatives such as lithium fluoride and lithium bromide. 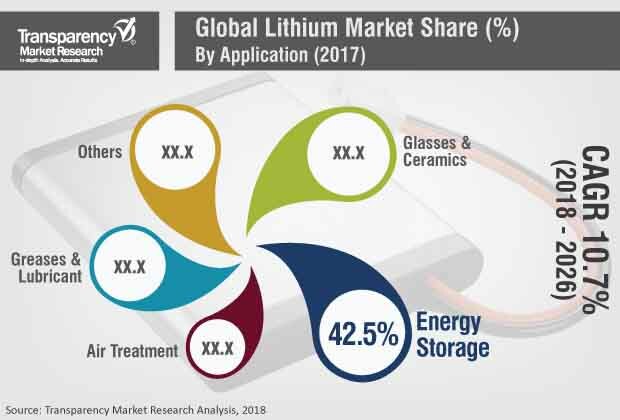 Based on application, the lithium market has been classified into energy storage, air treatment, greases & lubricants, glasses & ceramics, and others. The energy storage segment comprises applications such as E-vehicles, E-bikes, consumer electronics, and grid storage. In air treatment, lithium is used for removal of carbon dioxide and also for the dehumidification purpose. Lithium helps in maintaining viscosity of greases and lubricants. Lithium compounds are used as fluxing additives in the manufacture of glass. The others segment of the lithium market primarily includes medical and pharmaceutical applications of lithium. Lithium is used as a psychiatric medication for bipolar disorder. Increasing demand for lithium for use in lithium-ion batteries of electric vehicles is anticipated to fuel the global lithium market during the forecast period. Lithium-ion batteries are used in various types of electric vehicles such as hybrid electric vehicles (HEVs), plug-in hybrid electric vehicles (PHEVs), and pure battery electric vehicles (BEVs). Low density and high energy density are key features of lithium, which allow its use in electric vehicles. Rise in the demand for lithium for use in air treatment is anticipated to augment the market for lithium in the next few years. Lithium is used in cooling, dehumidification, and air regeneration applications. Shopping malls, hospitals, and other institutional facilities often employ absorption chillers made of lithium bromide as their source of air-conditioning. Use of lithium in space vehicles and submarines for removal of carbon dioxide is also on the rise. Lithium is witnessing increase in the demand in medical and pharmaceutical industries. In the production of drugs and agricultural chemicals, alkyl lithium is used as a synthetic agent. Lithium helps reduce mental disorders such as schizoaffective disorder and cyclic major depression. Implantable devices such as cardiac pacemakers, drug pumps, neurostimulators, and cardiac defibrillators employ non-rechargeable lithium-ion batteries. Secondary lithium-ion batteries are used with left ventricular assist devices, artificial hearts, and implantable hearing assist devices. Rising use in automatic external defibrillators (AEDs), which require low background current, is anticipated to present growth opportunities to the lithium market in the next few years. Production and application of lithium-ion batteries is rising in developed as well as developing economies. However, careless disposal of lithium-ion batteries is projected to lead to release of lithium into the environment. This lithium, in turn, enters the food chain. Minimizing the waste of lithium-ion batteries is an efficient way to reduce possible effects of lithium on the environment. Lithium-ion batteries possess significant potential to enhance the efficiency of renewable energy sources such as solar energy and wind energy. Lithium-ion batteries can help store excess electricity during non-peak hours, which can be made available during non-production hours. This can increase their usage in industrial and residential services, enabling the alleviation of peak-time electricity charges. With increasing pressure on various countries for reducing carbon emissions, the automotive industry across the world is shifting toward electric vehicles. Lithium-ion is the preferred battery technology for hybrid vehicles. Manufacturers produce lithium primarily for energy storage applications. The global lithium market is dominated by a few multinational players. This leads to intense competition in the market. Manufacturers such as SQM, Albermarle Corporation, Talison Lithium, FMC Corporation, and Jiangxi Ganfeng are some of the leading players operating in the market. Capacity expansion and acquisitions are a few strategies adopted by these companies to retain their leading position. Large players are highly integrated, which helps them decrease production costs and gain a competitive edge in the market. Key players are focused on the innovation of new technologies in order to gain market share and serve a diverse range of end-user industries.